Check it out… a grilled cheese sandwich that thinks it’s an aperitif (you know an alcoholic drink taken before a meal to stimulate the appetite)! 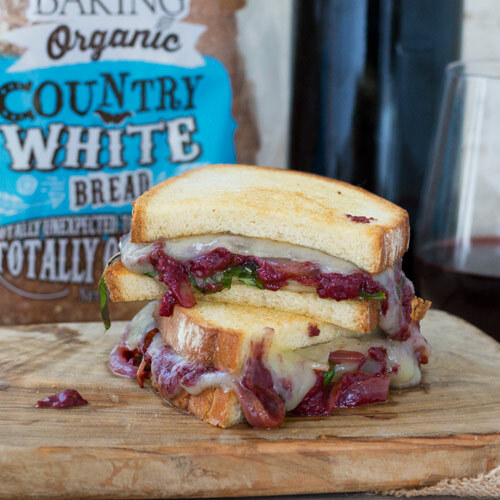 Not that we spend a lot of time drinking wine and dreaming up new ways to serve up our tantalizingly tempting Organic Country White Bread… at least not on the job. But we do devote countless hours researching our recipes. While it may have taken a dozen bottles of red wine to perfect, it was worth every drop. We wavered between using a Cabernet Franc, a Pinot Noir, and a Zinfandel, but it was the Merlot that met our taste buds’ high expectations. For best effect, serve with whatever leftover wine you may still have. Or better still, buy more and throw in a loaf or two of our Organic Country White Bread into the cart for good measure. In a skillet over medium heat, melt 2 tablespoons of butter. Add onion, garlic and rosemary, and sauté until onion is soft. Lower heat, sprinkle with flour and mix well. Cook for approximately 5 minutes. Add wine and let simmer until thick (approximately 5 minutes). Spread ½ tablespoon of butter on one side of each bread slice. Place one slice, butter side down, in a medium skillet. Layer with two slices of Gruyère, cooked onions, basil, two more slices of Gruyère and remaining bread slice, butter side up. Place skillet on stovetop over medium heat. Cook the sandwich, flipping intermittently, until cheese is melted and bread is golden brown on both sides (approximately 3-4 minutes).